In her classic ghost story “Kerfol,” Edith Wharton tells the tale of Anne de Barrigan, a young Frenchwoman convicted of murdering her husband, the jealous Yves de Cornault. The elderly lord was found dead on the stairs, apparently savaged by a pack of dogs, though there were no dogs — no live dogs — at Kerfol that day. In this remarkable collection of intertwining short stories, Deborah Noyes takes us back to the haunted manor to tell Anne de Barrigan’s story through the sympathetic eyes of her servant girl. Four more tales slip forward in time, peering in on a young artist, a hard-drinking party girl, a young American couple, and a deaf gardener who now tends the Kerfol estate. 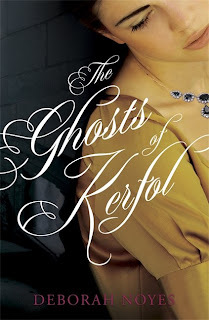 All of these souls are haunted by the ghosts of Kerfol — the dead dogs, the sensual yet uneasy relationships, and the bitter taste of revenge. This series of short ghost stories I found quite eerie. The first of the stories was definitely my favourite, spooky and beautifully told and subtly scary, the atmosphere building and building throughout. It was also the longest story in the collection. I loved the concept - five short stories told from different narrators set years and years apart, but all centering around the same haunted manor - and I felt it was well executed. In each subsequent story there were references to the ones previous through paintings and so on, which helped tie the stories together. The conclusion in the fifth and final story was somewhat satisfying, however the first story was definitely the best, and though the rest of the stories were well-written and enjoyable, with a slight sense of building tension, the book didn't really return to or end with the level of spookiness that was achieved in the first story. I wonder, perhaps, if reading the stories in the reverse order - starting with the story set in 2006 and going back to the story set in the 17th century - would be a more interesting reading experience, and would give the reader more of a sense of that building sense of tension getting somewhere and more of a sense of revelation. This didn't strike me as a specifically YA title - all the narrators, from the young maid to the deaf boy restoring the manor, are teenagers, however the themes and storylines don't seem particularly teenaged - fidelity, for instance, was a prominent theme. I imagine this book would also be enjoyed by adult readers. Highly recommended to anyone who likes old ghost stories! A beautifully written and eerie read.